Nestled in the foothills of the Blue Ridge Mountains near the Shenandoah Valley, is Briar Patch Bed & Breakfast Inn, a Middleburg, Virginia bed and breakfast, offering charm and hospitality to match its historic location. Briar Patch is a historic farm (circa 1805) on 47 rolling acres with majestic mountain views. Located in Loudoun County, we are in the heart of Virginia horse, antiques, and wine country on Route 50 (John Mosby Highway), 4 miles east of the town of Middleburg. Just 20 minutes from Dulles Airport and about an hour from Washington, DC when you enter our world, you leave the stress behind. Stay in one of our eight bedrooms in the main house or combine two rooms to create your own private suite. For even more privacy, stay in our one bedroom cottage with a fully equipped kitchen. Or stay in our newly constructed Chicken Coop with its 3 bedrooms all with private baths. Hold your wedding, family celebration, business meeting, group picnic, or off-site retreat in our indoor facility - The Fox Den at Briar Patch for up to 200 guests or on our beautiful grounds. Relax around or in our large pool or soak in our hot tub. Curl up with a good book on our front porch overlooking Bull Run Mountain. View the horses grazing in our fields. Bring your pet and enjoy exploring the area. Bring your family for a fun-filled vacation. The main house has eight bedrooms, all furnished with antiques. Two rooms on the first floor (the Iris and Daisy Rooms) each have private baths, private entrances/exits, and queen beds. The main house has six bedrooms on the second floor, each with a shared bath. For additional comfort and privacy, two rooms can be combined to create a suite with private bath. Five of the six bedrooms on the second floor have queen beds and one (the Violet Room) has a king bed. Each bedroom is named after a flower to reflect the colors and scents of the flowering plants surrounding the house and cottage. For even more privacy, we offer a separate cottage with a fully equipped kitchen, living room (includes a futon sofa bed), dining area, bathroom with a tub and shower, and bedroom with a queen-sized bed. Access to a computer for email or printing. We look forward to hosting you at Briar Patch Bed & Breakfast Inn! Briar Patch Bed & Breakfast is an ideal site for your Virginia wedding, perfect for small intimate weddings & parties or large events for up to 200. Your wedding or party at Briar Patch will provide you and your guests the opportunity to spend quality time together. Our outstanding accommodations, breathtaking country setting, and exceptional service are what set us apart from other wedding and reception sites in Northern Virginia. 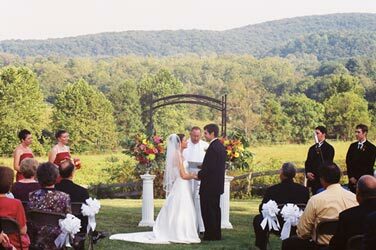 Briar Patch Bed and Breakfast Inn is the ideal location for your destination wedding in Virginia. Whether it's a small, medium or large wedding or party; an indoor, outdoor, or combination wedding or party; or a weekend or weekday wedding or party. We have a wedding package that fits your needs and your budget. For weekend weddings, most people have the rehearsal dinner on Friday night in a grassy area by the pool, the ceremony on Saturday outside in one of several locations on the property, the cocktail reception in front of the main house, and dinner and dancing in The Fox Den at Briar Patch building. With its 47 rolling acres, beautifully landscaped grounds, inviting lodging accommodations, and great mountain views, Briar Patch Bed & Breakfast Inn is an ideal location for your Virginia reunion, wedding & reception, or other special event. 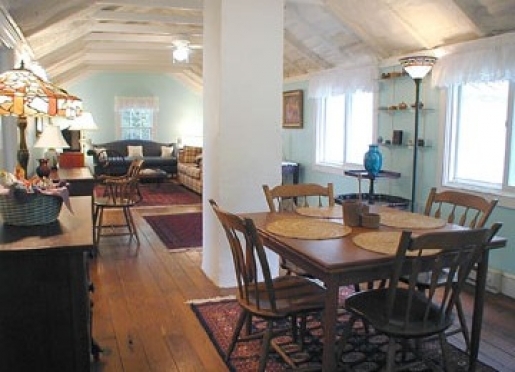 The Virginia meeting facilities at Briar Patch Bed & Breakfast Inn make our B&B an ideal location for meetings. 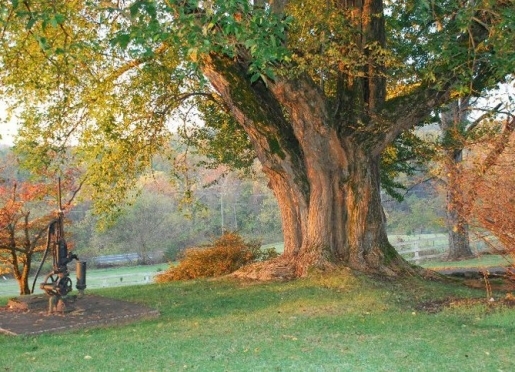 Our rural retreat center in Northern Virginia provides a relaxed setting that puts people at ease, resulting in productive and creative meetings and planning sessions. Combine business and fun by splitting your time at Briar Patch with meeting time and time for fun activities. About an hour west of Washington, DC and 20 minutes from Dulles International Airport. Close to many of Virginia's finest wineries. Close to historic towns of Middleburg, Aldie, Leesburg, Purcellville, Waterford, and Manassas with many antique shops and fine dining. We are in the heart of historic Virginia horse country with many attractions for the equestrian including horse shows, riding, steeplechases or point-to-point racing, fox hunting, and polo. Explore the beautiful winding country roads dotted with picturesque farms and views of the Blue Ridge and Bull Run Mountains. We are within an easy drive of many historic Civil War battlefields, including Manassas National Battlefield Park and Bull Run Park. Sports enthusiasts will enjoy horseback riding at one of the local stables, playing tennis, golf, or other sports, hiking on mountain trails, or biking through the beautiful countryside. This area satisfies diverse interests and lifestyles. For the shopper, we are near an outlet mall in Leesburg. Also, an on-site swimming pool, public tennis courts are nearby, lots of places to hike or bike in the area, and golf club nearby. Perfect for day trips to Shenandoah National Park, Harper's Ferry, Shepherdstown, or Charles Town. 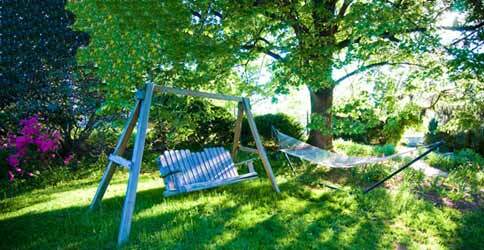 Briar Patch is a pet friendly Virginia bed and breakfast. We welcome four legged guests when arrangements are made in advance. Our country inn is a welcome alternative to lodging at impersonal chain hotels when traveling with your pet in Northern Virginia. Responsible, parentally supervised children ages 8 and older are welcome in the main house. Children of any age are welcome in the cottage. 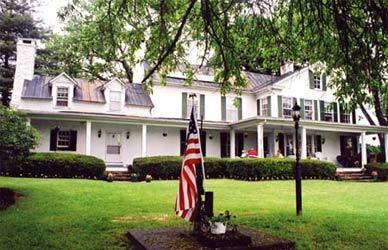 Briar Patch Inn Bed and Breakfast is conveniently located in Loudoun County, Virginia. Nestled in the foothills of the Blue Ridge Mountains and near the Shenandoah Valley, our historic, country B&B near Middleburg, VA provides lodging approximately one hour from Washington, DC and just twenty minutes from Dulles Airport. Whether you are planning a romantic weekend getaway for two or an extended family vacation, the inn is the perfect home base for exploring all that the Northern Virginia horse and wine country has to offer.